DOWNLOAD Over 175 R&B Hip-Hop Guitar Loops w/ Free Upload! 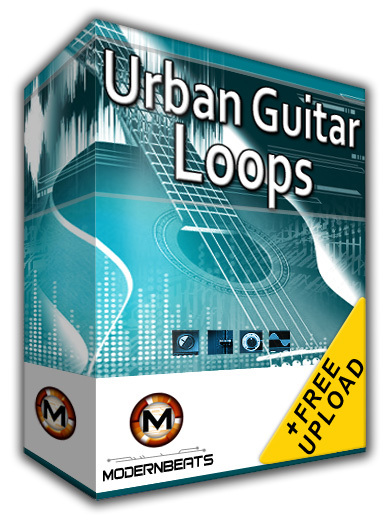 Download Urban Guitar Loops 1 - Featuring over 175 blazin' guitar loops in WAV/AIFF/REX2 formats (534 files total) performed at 87BPM & 97BPM, ModernBeats delivers simply the hottest performed guitar riffs you'll find in Hip-Hop - "Urban Guitar Loops 1"! Resulting in one of ModernBeats' most powerful loop libraries to date, this musically "organic" guitar loopset captures a vast array of amazing live recordings from one of Hollywood's most renowned urban guitarists BigChris Flores. In addition to all live recordings contained within, this loopset also features platinum-level loop programming reminiscent of today's Hip Hop hits. Guitar styles include the Neptunes, Kanye West, Swizz Beats, Dr. Dre, Timbaland, DJ Premier, Bomb Squad, plus ModernBeats' own "patent-pending" signature style! Urban Guitar Loops Collection - Download the complete collection (Volumes 1 & 2) for over 350 blazin' hip-hop guitar loops in WAV/AIFF/REX2 formats (1,056 files total) performed at 4 industry tempos (87BPM, 92BPM, 97BPM, 102BPM) and in 4 keys (A, C, E, G). The whole Urban Guitar Loops series launches music production to the forefront with it's rich variety of modern guitar styles and themes for both mainstream and underground hip-hop alike! Urban Guitar Loops 1 & 2 works seamlessly in combination with all other existing ModernBeats loopsets, utilizing same group & tempo layouts. This allows users to build full productions within minutes by mix-matching & layering loops from any variety of ModernBeats loopsets together! With up to 4 variations for each guitar theme included, users are able to create music productions that feature more desirable, longer evolving musical phrases. Equipped with the ModernBeats standard, you can now build groundbreaking, urban hits fast with access of up to 4 variations per guitar theme. Raise the standard, Demand the best - "Urban Guitar Loops" will launch your productions into a world above the rest!